Apple announced its new iPhones on Wednesday and used up a decent chunk of its presentation talking about the cameras. As you’d expect, Apple says the cameras in the new iPhone XR, iPhone XS, and iPhone XS Max are better than previous iPhones. Much like last year’s devices, the cameras on each of the new iPhones are all 12 megapixels, but they have some under-the-hood improvements both on a software and hardware level that could potentially add truth to Apple claims. We’ll have to check for ourselves when we get our hands on the devices, but for now, here are the improvements and updates Apple has made to the cameras in all of the new iPhones. All three new iPhones have Apple’s new Smart HDR camera feature. With Smart HDR, nine photos with different exposures and settings are taken the moment you press the shutter button. Apple’s A12 chip inside the new iPhones analyzes these nine frames and combines the best parts of each frame into a single photo. This feature is available on the iPhone XR, iPhone XS, and iPhone XS Max. The ability to adjust the blur in the background has been added to all three phones. In Portrait mode on both the rear and selfie cameras, you’ll be able to adjust the amount of “bokeh” – the blurry background effect you’ll often see in professional photos – after a photo is taken. Apple’s Phil Schiller claimed the iPhone is the first smartphone to have this ability, but that’s not the case. Samsung’s recent Galaxy smartphones already had this feature, where you can adjust the background blur on photos after snapping them. All the cameras are now better in low light. The camera sensor in the regular wide angle lens – but not the 2x telephoto lens – has deeper and larger pixels to capture more light, which should lead to better low-light shots. All three phones will take better action photos. Combined with zero shutter lag and faster sensors, action shots with fast movements should look sharper. The new Smart HDR feature will also add better details and colors in both shady and bright areas. The new iPhones can do more things under the hood to make photos look better. Apple says that the neural processor that’s part of the A12 chip in the new iPhones can perform up to five trillion operations that can help take better photos. Some of those operations include face detection and figuring out where your facial features are. Combined with Apple’s own image signal processor, the new iPhone cameras can better differentiate subjects from backgrounds for depth effects, altogether making for better photos – hopefully. The iPhone XR, iPhone XS, and iPhone XS Max all have the new A12 chip. 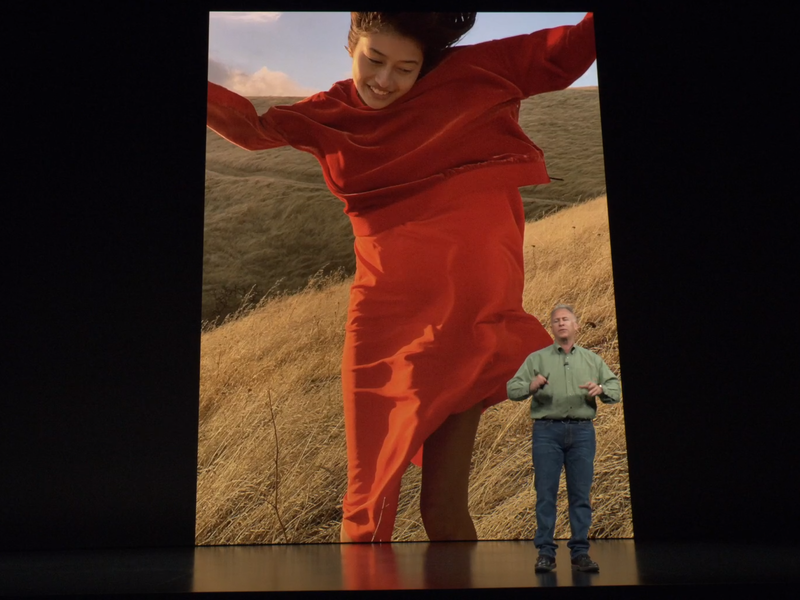 In fact, the only camera feature you don’t get with the $750 iPhone XR is a second lens on the camera — a feature that helps the pricier models get a 2x optical zoom. The iPhone XR, iPhone XS, and iPhone XS Max share almost every camera feature, including Apple’s latest software and hardware upgrades to make photos look better. The only thing the cheaper iPhone XR’s camera doesn’t have is the 2x “telephoto” zoom lens from the iPhone XR and XR Max. That means the iPhone XR will take photos that look just as good as its more expensive counterparts, but you won’t be able to zoom in with the same level of detail and clarity. Everything Apple says about its new cameras is well and good, but they’re just claims for now. We’ll have to see for ourselves if the new iPhones actually take better photos. The iPhone XS (left) and the iPhone XS Max. I have a feeling that it’ll be hard to notice the camera improvements, as they seem somewhat incremental over the previous iPhone X and iPhone 8 cameras. But I’m always willing to be pleasantly surprised. The new iPhone cameras will surely be good – as they always have been – but we’ll have to see if they’re that much better than previous iPhones, as well as some of the top Android devices.